Here is the second set of "Miscellaneous" caps. 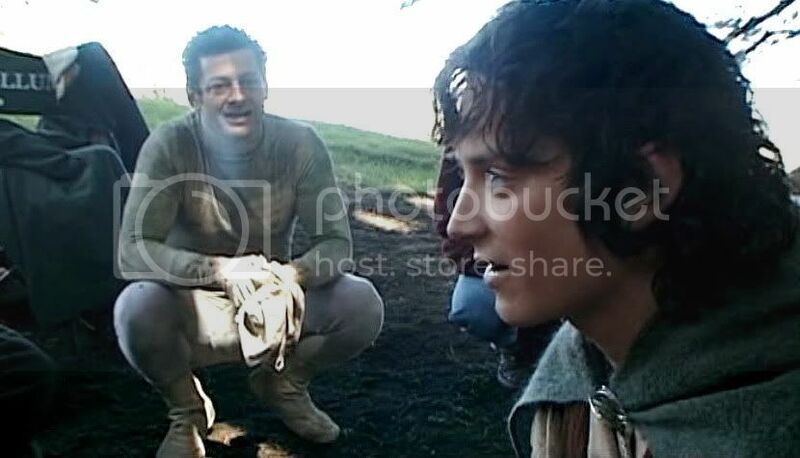 The little series below comes from a bit of interview in which Elijah Wood is remarking on the challenges of playing the Cirith Ungol ledge scene (in which Sam is sent home). It's a rather ill-lit, badly-focussed sequence, but I like the happy, light look on Elijah's face as he speaks, and I never tire of his profile, of which there are few sustained shots throughout the actual three films. 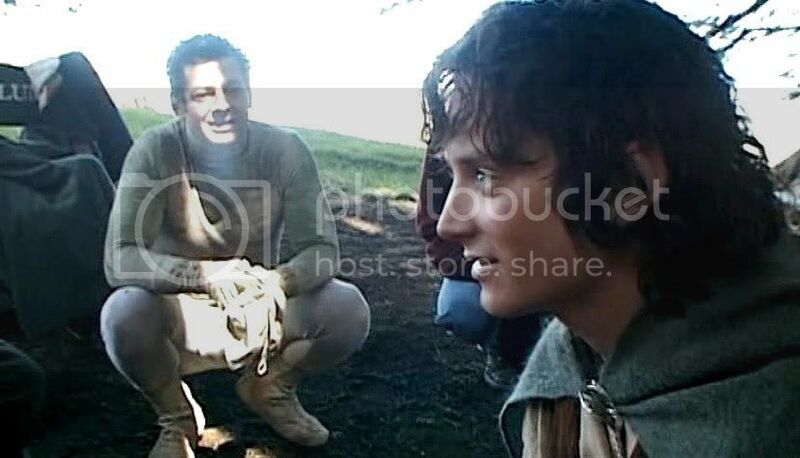 They were only beginning the filming of FotR in 1999 when there were big floods in Queenstown. No exteriors could be shot and no filming spaces of size were available to re-create larger scenes indoors. They settled on building the rocky ledge for this scene in a squash court at a motel and shooting this late-in-the-story episode out of sequence. Neither Wood nor Astin wanted to have his coverage shot first, since they still were wrapping their minds around their characters at the opening of the story. A coin was tossed. Astin's coverage would be shot first. During this series of frames Elijah is explaining how difficult it had been to do; to jump into such a highly-wrought scene, before they had played any scenes from TTT or RotK, but also to imagine Gollum. They had not yet had a scene with Gollum, and there was no Andy Serkis. (Imagine: this scene was shot before the Emyn Muil!) He had not yet been cast. Andy Cook, director of animation, played Gollum (very well, too), jumping about with a script, doing Gollum's blocking and lines. 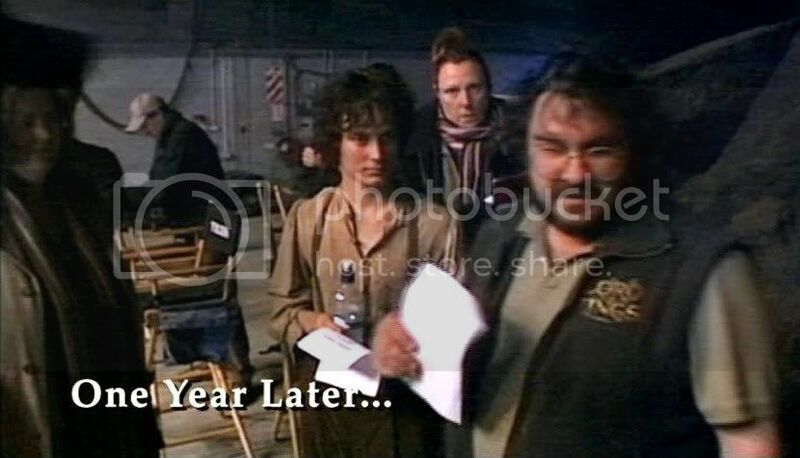 What I find interesting re-examining this bit of documentary footage is that Philippa, Fran and Peter Jackson from the beginning of shooting had conceived of this scene ("to up the ante") in which Frodo and Sam are made to do this out-of-character departure from book canon -- doubly out of character since not only does Frodo send Sam home, Sam ("I made a promise never to leave you, Mr. Frodo!") actually goes! I think that because I knew they were constantly rewriting the script as they went along, adding this, tossing that, that this scene was an ill-judged later effort to increase the tension between these characters. But, no, this had to have been in the original script. I am one of the few viewers who actually enjoys watching this scene on account of the acting and camera work which is absolutely excellent. 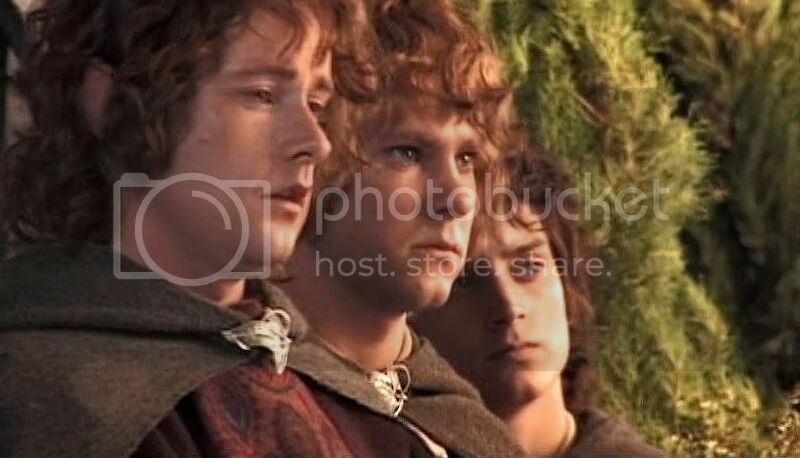 It works dramatically within the adapted story as conceived by the director and writers -- that is with a Frodo who can get into irrational snits and a Sam who would actually be bullied out of keeping a promise. But each time I watch it, once the scene is over and the spell of the acting is broken, my mind and sensibilities snap back to narrative-sanity and I wonder, "How could they do that?" 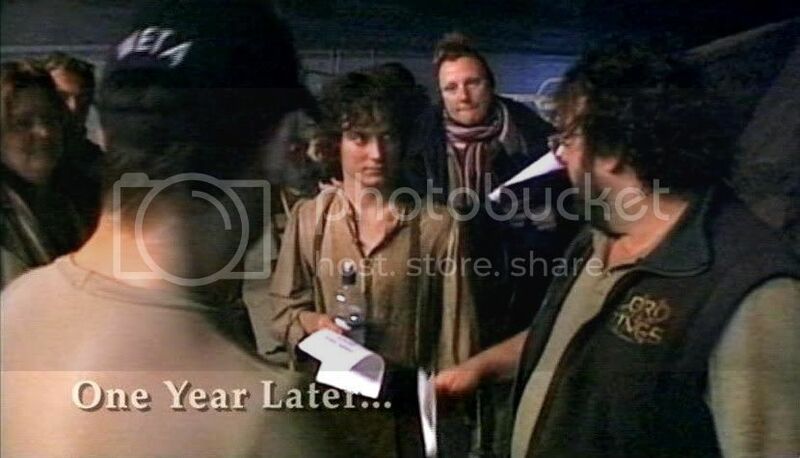 Below are two caps that come from the very next sequence, in which it is explained that because the weather suddenly cleared up, they went back to shooting outdoor sequences from FotR before they could shoot Frodo's coverage in the ledge scene. 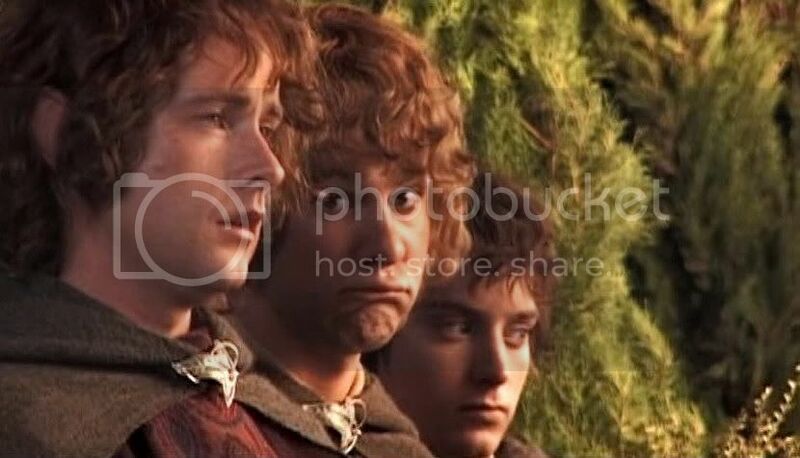 Therefore, it was another year before Frodo's speeches and reaction shots were filmed. That must have felt pretty odd! I enjoy all the more, therefore, watching this problematic scene knowing that Frodo had aged a year each time he answered one of Sam's or Gollum's remarks. 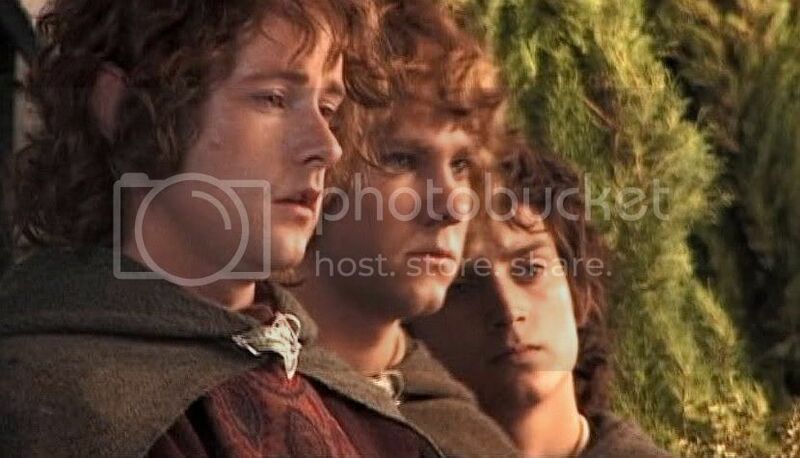 I loved the look of Frodo in these scenes enough to make these caps, even if they are a little distant and poorly focussed. As usual I brightened and focussed all these caps, but I could only do so much. Last is another series of frames from the documentary, covering the filming of the farewell scene at the Grey Havens. I am sure you all have heard how this was an emotionally wearing sequence to film: long and teary and draining. You also heard how after lunch Sean Astin neglected to put his waistcoat back on, and the footage shot was declared no good, since it didn't match (there is still one quick shot left in the TE in which Sam is sans waistcoat; it must have been the best take and PJ left it in). When the new footage was screened, however, it turned out to be out of focus. PJ had to break the news to them that they would have to act the scene yet again the next day. Side note: Sean was castigated by all, of course, although I think in this instance it was as much the responsibility of crew members as Sean; the continuity person and/or wardrobe person should have noticed this. They always have to check and make sure the actors' hair and make-up are the same from shot to shot; why not their costume pieces? 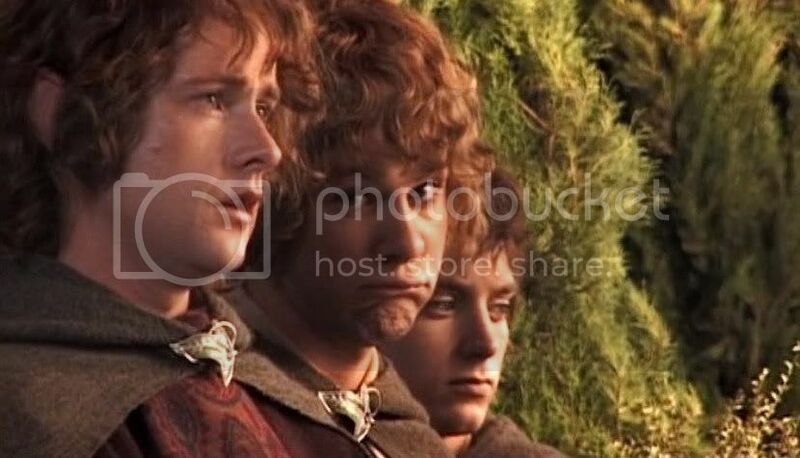 These caps are from one of the pieces of footage showing the hobbits waiting to continue the scene. Dominic Monaghan obviously slips out of character for this one, but it's only for a moment when the film is running. 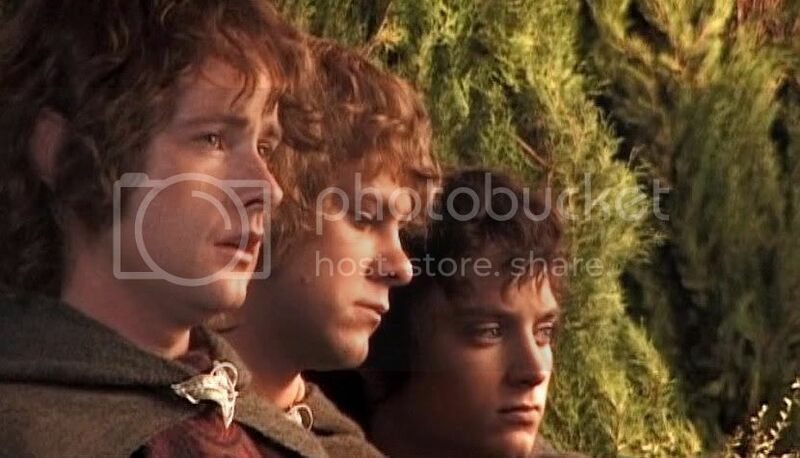 I actually made these because I loved the subtle shift of mood on Frodo's face -- for he is Frodo here -- he and Billy Boyd clearly have remained in character. Believe it or not, I didn't even notice the silly face Dom made until after I had made the caps. 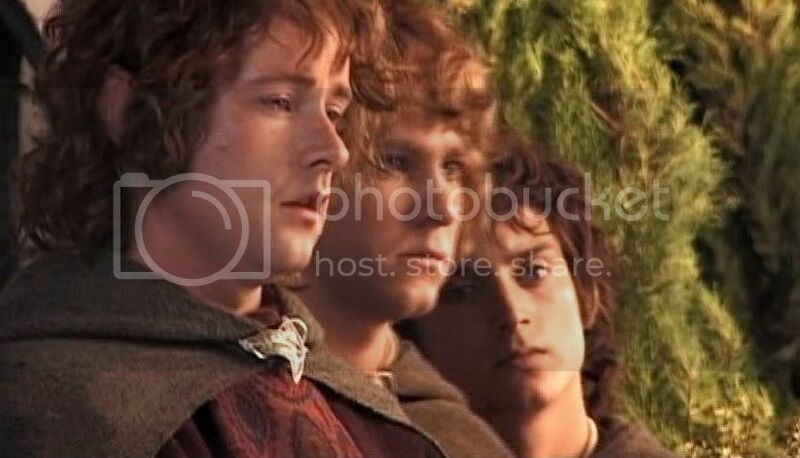 Talk about being a fan who only has eyes for Frodo! Table of all screencap entries here. I enjoy all the more, therefore, watching this problematic scene knowing that Frodo had aged a year each time he answered one of Sam's or Gollum's remarks. Wow, I need to go back and re-watch that scene. How fascinating. How DID they do it??? Thank you for these lovely caps, as always! Yes, it was a treat to go back and watch this extra again. I hadn't seen it for quite a while. It really impresses me each time, what a monumental thing they pulled off, as individuals and together as a team. P.S. I finally figured out what you meant. After slogging through making this entry and the one I just posted unable to use the select/delete/copy/paste function, I did some searching around through the FAQ's and found the place that talked about what "Horizon" was; it was not what I thought you were talking about. I switched it back to what it used to be and now I can use those functions again. Whoopee! It was a shame in a way, since I finally could use Richtext, which I never could before. But having Richtext wasn't worth losing those other abilities. Not by a long chalk! Thank you so much, Mews. He just makes that little face to the camera for that split second. I think he needed that little break from what he said in the interviews: "If there were a "get out of jail free" card to get out of doing any of the days of shooting, it would have been that one" -- or words to that effect. I thought he was terrific in that scene, though, just weeping with such honesty; it was some of his best work in the film. These are so bea-uutiful!! I love Frolijah standing there with a water bottle. He looks so dignified and and touchable-- it sort of makes me want to cry!! And the Merry, Pippin, Frodo caps!!! geez he's beautiful. Nothing too intelligent to say, here. Just sigh a little. I love him in that scene, too, Alyon. I think he's already entered the zone as Frodo in those shots. He's not Elijah. Yes, he is beautiful in those shots of all three of them. That's why I capped them. All the while I was saying, "How I wish they were more in focus! But still, what a ravishing creature he was!" Thank you so much for the lovely caps. 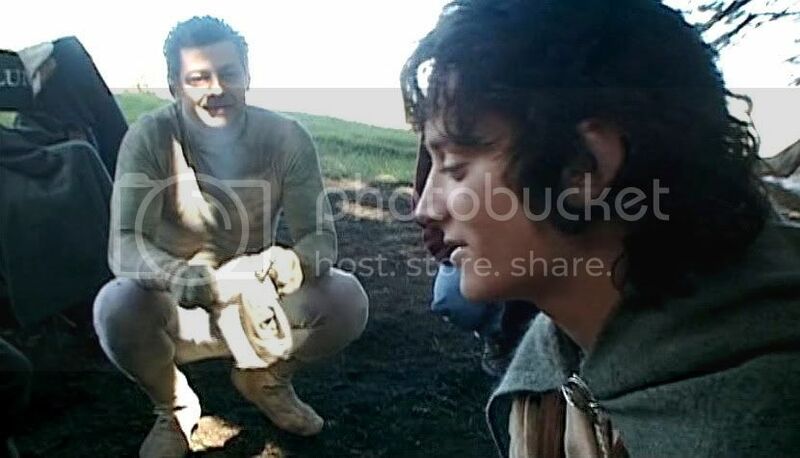 I love how you can always tell when "Frolijah" is Elijah...or completely in character as Frodo. It's immediately noticeable and another reason (amongst the zillion) why I adore Elijah. Yes, it was very clear when he was in character in all these behind the scenes shots. He was incredible, especially at his age. Yes, indeed. 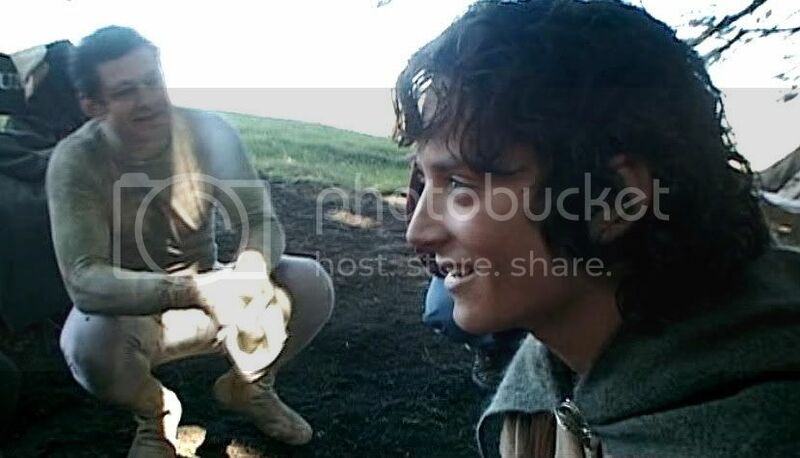 It is simply amazing how he morphs into Frodo, just like that. How lovely he is in these caps. Such a beautiful, patient, melancholy angel, already detached from the cousins he loves so much. And Billy has morphed into Pippin. He looks so sad and tearful. Aren't they all dear, in the older literary sense of the word? That is, not said with any irony, but "to treasure" or "to cherish". I loved your description, "A beautiful, patient, melancholy angel." I think that is what I saw, too, Pearl, and perhaps what drew me to make the caps. Almost like an angel on an old "in memoriam" painting or sculpture. Eeeee! Your documentary footage screencaps made me craving for the new documentary of the Limited Edition. I must wait TWO more weeks for region 2 DVD release! Sigh! I love madly those documentaries and all sort of 'making of'. 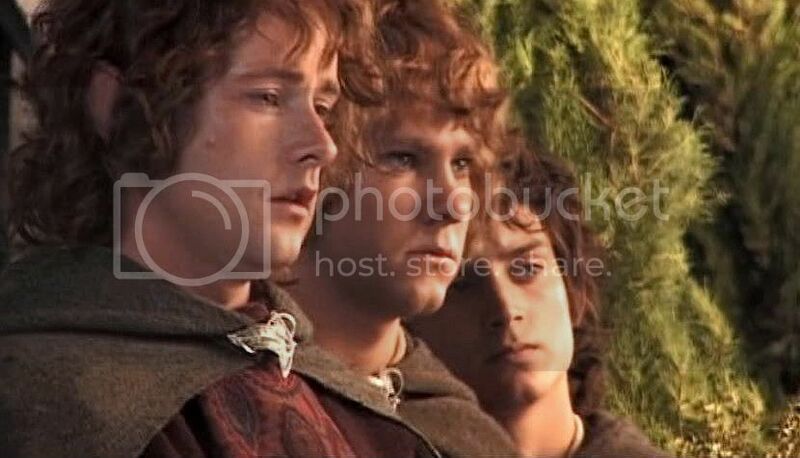 I have seen the extra DVDs of the EE propably with the same frequecy of LOTR, and I'm never tired. Elves at Helms Deep? So what. 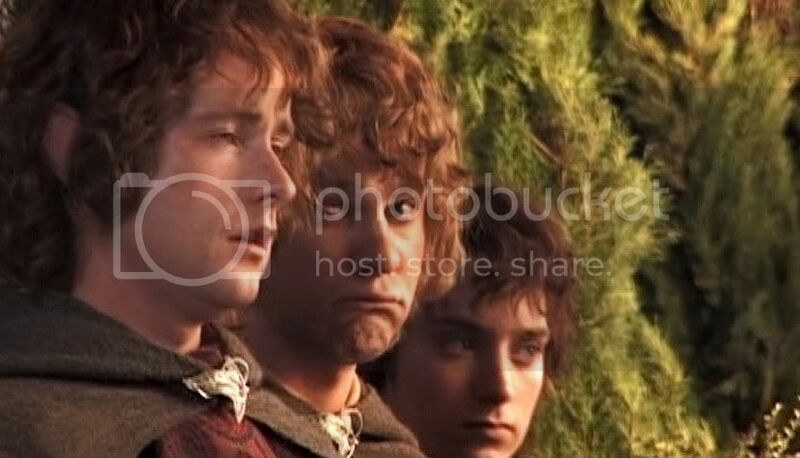 Frodo sending Sam home, and Sam going? Very Nearly Unforgiveable! Seriously, the first time I saw RoTK (on Trilogy Tuesday) I cried all the way home I was so mad a PJ. I've learned to just focus on the acting during that part. RoTK nearly rivals FoTR for my favorite of the three, but this scene alone tips the scales. I've learned to just focus on the acting during that part. Too bad they couldn't have poured it into a canon scene. But, for what was written, I think all three (yes, including Andy Serkis and the artists that helped put his performance across for him digitally) did sensational jobs in it. What a wonderful spam! And I love your personal reflections! Thanks! I always mean to make screencaps, and never do. I love how you tweak them. I sure love what you do with them! Thank you Mechtild for all your time, skill and patience you share with us. 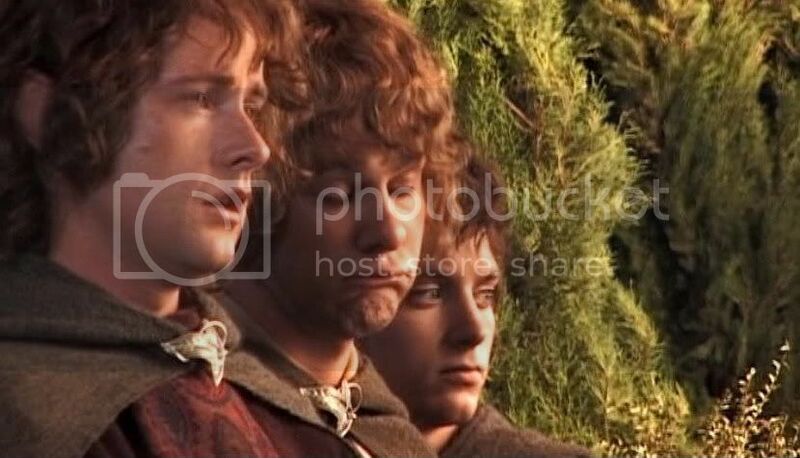 I am so very glad that I am alive here and now and that I have had the privilege and joy of experiencing the LOTR fandom as it took/takes place. It is a gift, all this extra material that we fans get to look at again and again, like taking out old magazine clippings in the old days (before media technology) about a treasured public event, to look at "just one more time". I agree wholeheartedly with you on EJW's profile. As an artist I think he has one of the most perfect faces known to man. He is truly beautiful, and like you, I can't look at him enough. I have always disliked the Grey Havens scene because I bawl like a baby. 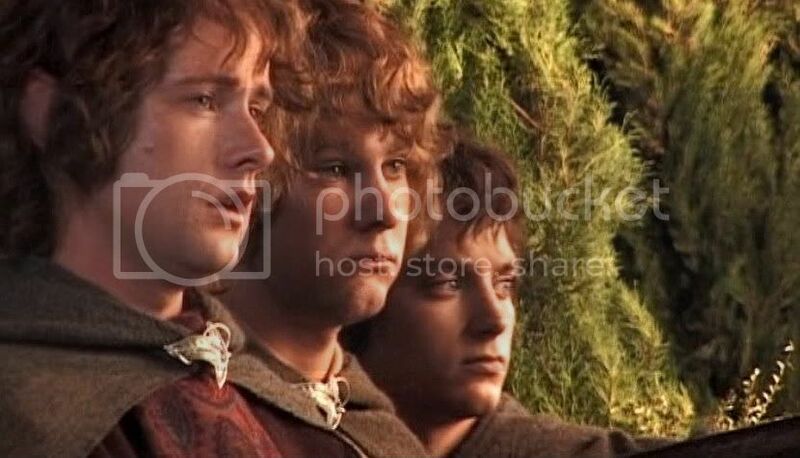 I think what always bothered me about it is that is was so *final*, and Frodo says nothing to Sam about joining him when the time is right...that always made me nuts, and I would have felt so much better, hopeful I guess, to know that PJ made the story go on, even if we weren't privvy to it. These are lovely, thanks so much for posting them. You've done such a wonderful job with all these screen cap post. I know just how much work this is and am very grateful for your efforts, hun. I'm currently putting together an archive of all the behind the scenes images from the movies and am wondering if it would be alright with you if I added some of your screen caps to it? You've been able to get some great shots and they would make the archive so much better! That's fine, Random! Spread the pleasure and resources around. This coming week I'll be posting caps from the Extras for the theatrical version of TTT. Stay tuned. We are going away for a couple of days starting this afternoon, so I can't work on the posts to present them until I come back, but they're all made. Another person who probably has a lot of behind the scene stuff (since she's been working on her "The Journey of Frodo" series for a long time) is not_alone. Wonderful! thank you for your help, hun! I've just posted what I've put together so far. I'd like to know what you think. I;m out of town right now and am on a borrowed computer, but I will look when I get back and settled in. Thanks for letting me know!